Any of these pleasant scenarios sound familiar? Real-world content creation and marketing teams are not perfect and this type of stuff happens. Even with more experienced editorial teams. However, if your team scales along with the number of projects, you’ll need an organized process to keep everything on track and aligned with set goals and deadlines. You need to ensure great workflow and define it even before your pen touches the paper or a keyboard button gets hit. Every content marketing team has its workflow defined - either spontaneously or by a person in charge. Everyone in your team knows that certain people do certain things at certain times. And the process is repetitive. However, not all workflows are properly organized. This is best seen when number of projects starts growing and the volume of work increases. This system enables transparency and keeps the whole team oriented towards the common goal. It helps with the early discovery of the process’ bottlenecks and countermeasures against them to improve overall efficiency and optimize delivery. Most importantly, by having everything well documented, it helps you learn faster, onboard new members with ease, and scale your team. For workflow visualization, click best presented on kanban. Usually, the main problem with work framework (process) implementation with any team - is in understanding the process itself. Even if you hire an experienced project manager to run your team, it will not necessarily work for you. It’s up to the team and its project manager to optimize the workflow to its needs. In order for it to scale, it would need to properly stage each phase of the process. Team members need to visualize the goal of the project clearly before it even starts. While marketers and writers will be focused on content, audience, conversions, and funnels, the designers will put their attention to purpose, experience, journey, and emotion. Even though they are still oriented towards the same goal - and that is providing a piece of content that will activate the end user, they all see it through different lenses and take in mind different metrics. The number of people at your business included in this phase varies based on the scope and volume of the project, as well as the type of content that needs to be delivered. When it comes to collaboration on static content, the basis should always consist of a writer and designer working together. Interactive content (like quizzes or games) requires including a developer to add the interactive layer to the draft. Optionally, depending on the complexity of the content and its orientation, you will need to include a legal adviser. People tend to work outside the initial outlines of the project without consulting the production team or the content strategist. This is why this phase in particular has to be backed with QA testing. A UX designer and QA tester need to be included, and survey research and user testing are always recommended, no matter the project size. It’s almost impossible that the initial draft goes published without edits. But let’s imagine a perfect world. After the content has been approved, it’s set off to the production manager and then it gets published. Most often, the developer gets overseen and everything is left guided solely by the content strategist and the designer. Each piece of content needs to be validated for its success in achieving the goal it was designed for. Setting up early monitoring (conversion and performance tracking) can help you develop and test different variants of the content. Whether it’s A/B/n testing (different variants of the page) or multivariate testing (different variants of individual elements of the page), you will always need to test and adapt. The initial content concept may not perform well on every distribution channel. Maybe it’s the type of content that’s wrong, or the messaging it conveys is incomprehensible, or it hasn’t reached the right audience. But the beauty of the workflow is that, with early monitoring and process documentation, you can identify the problem and return the project to the desired phase. Whiteboards, post-it pads, and markers are fun, but not effective with larger or remote teams. Group meetings are valuable for brainstorming sessions, but are not always easy to organize. Email communication and various messaging apps can create too much confusion. In order to implement the framework, each team member needs to have a clear visual of the task assigned to them. In most cases of managing projects with larger scope or volume, several people will be assigned with a single task. Assets need to be available to be handled by multiple people at the same time, rather than going through peer- to-peer process. It’s time-consuming and a huge setback. You can leverage this with cloud based project management. By adding more QA testing cycles and feedback loops, you add layers to the project management process complexity, but the framework stays the same, since the phase kanban is consistent. Experiment with the setup to see which works best for your team. And put emphasis on monitoring and documentation. That way you can learn from your mistakes, identify and take measures against process’ bottlenecks, and create a scalable solution for your team’s expansion. 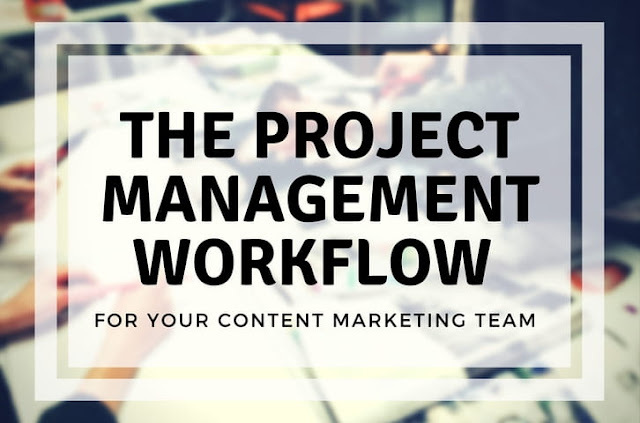 I hope you enjoyed this article about the project management workflow for content managers & marketing teams. Interested in more articles about content management?